"It passed this way. Whatever it is..."
The intersection between magic and technology always makes for an interesting read. Today's modern world is short on the former and heavy on the latter, but that doesn't mean there isn't room for both in stories. 8House: Arclight #1 from Image Comics is a story that blends both together well. 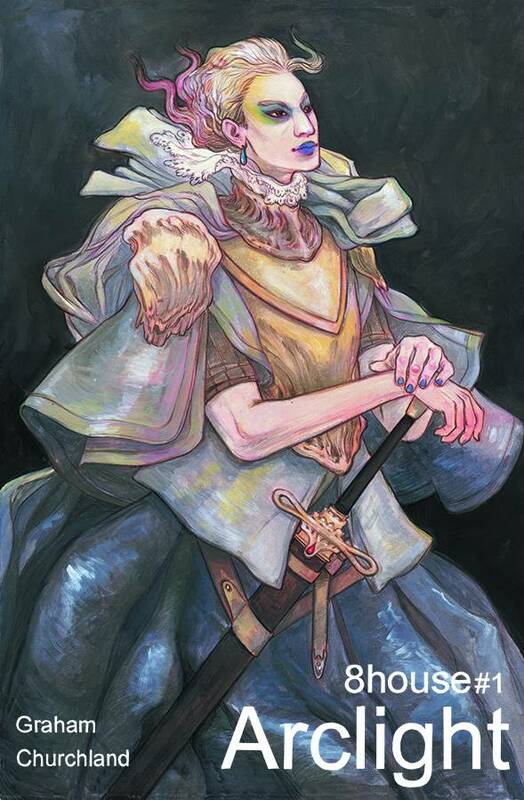 8House Arclight #1 is written by Brandon Graham, illustrated by Marian Churchland and lettered by Ariana Maher. From the outset, 8House: Arclight #1 is meant to be magical and awe-inducing in a mystical way. Graham achieves both objectives quite deftly, spending the majority of the issue focusing on Sir Arclight and Lady relying on magic to answer outstanding questions. Their relationship is presented as more than familiar--almost romantic--and works to great effect. Their bond extends to a scene later on where Arclight feels compelled to defend Lady with the threat of violence, something that speaks to the world that Graham is carefully crafting. It's a world that mixes a modern feel with the antiquity of magic and works as a backdrop for something that's not entirely explained at first. Churchland relies on an illustrative style that's simple and evokes comparisons to Yoshitaka Amano from Final Fantasy fame. Simple lines depict characters, while backgrounds seem to show more detail. Churchland depicts both Arclight and Lady as clear indicators of a foreign, fantasy world, but they don't devolve into a dungeons and dragons look. Many of the faces are very expressive, which adds a healthy emotional element to the book as well. The panel layout is relatively straightforward, save for a few full-page spreads that offer views of sweeping landscapes. Churchland also uses color to great effect, for instance making the "magic goose" a sharp red that pops off the page. 8House: Arclight #1 is a fanastical book that doesn't hide from its own mystique. While the particulars of the plot are still a little vague after the first issue, there's a lot of world-building that will definitely pay off down the road. Graham's writing style is simple yet concise, giving characters a solid breadth of emotion and interaction. Maher's art style is airy and mystical, transporting the reader to the kingdom rife with magic and technology. 8House: Arclight #1 is a great first issue that has a somewhat slower pace, but it laying the groundwork for a much more intricate story. 8House: Arclight #1 is in stores now.